Wash and clean chicken, remove all the internals. Pat dry. Rub the chicken with some salt all over on the skin and on the inside of the chicken. Let chicken stand for at least half an hour at room temperature. 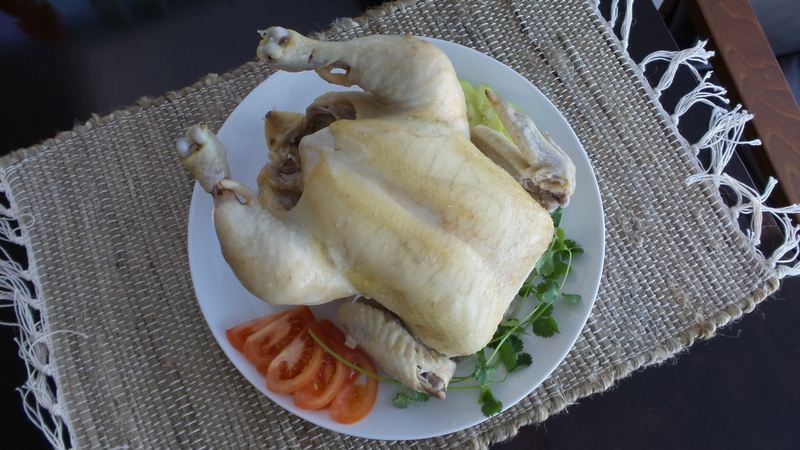 If you leave the chicken in the refrigerator overnight, remember to remove it from the refrigerator at least an hour before cooking to let it come to room temperature. Otherwise, the chicken will not cook evenly. Stuff the chicken with the garlic, ginger, and green onions. Bring a deep stock pot with 4 pints of water to a rolling boil. Add the chicken, the water should just cover the chicken. Add more boiling water if needed. Leave the stock pot uncovered, and let the water return to a boil. Reduce the heat and cover the pot. Let the chicken simmer for 50 minutes. While chicken is boiling, fill another deep pot/container with ice cold water. When the chicken is ready, remove from the stock pot and immerse it in the ice water to stop the cooking. Let is stand in the water for 10 minutes. Transfer to chicken to a large plate and brush the chicken immediately with oil. Remove the stuffing. Cool the chicken completely before cutting it into pieces. 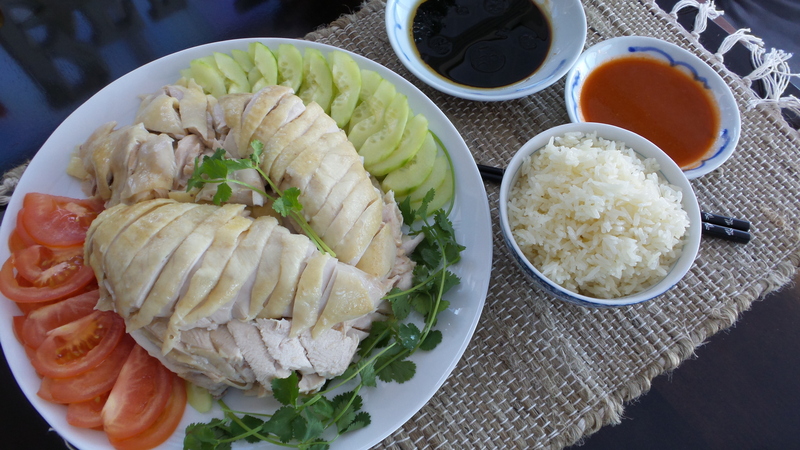 Cutting the chicken is an art and requires a sharp knife and the guts to hack away. I have not attained that level of expertise and have resorted to debone the chicken instead. Arrange on a large serving plate and garnish with sliced cucumber, tomatoes and cilantro. Save the chicken stock for cooking the rice and soup. 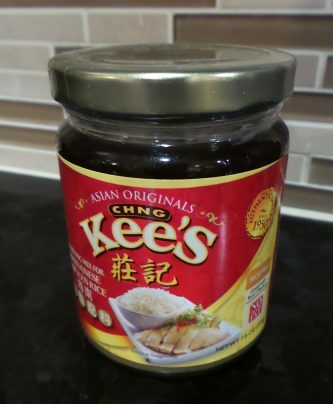 I am lucky to have access to Chng Kee’s Chicken Rice mix here in the Chinese Grocery store. I follow the instructions and use the chicken stock instead of water to cook the rice. The results is fantastic. 750 ml of chicken stock from boiling the chicken, adjust accordingly if cooking in rice cooker. Wash and rinse rice and add to rice cooker. Stir chicken rice seasoning mix well and add 4 Tbps to the rice. Add chicken stock to rice cooker. Adjust the amount according to instructions for the rice cooker. When the rice is ready, fluff the rice and keep warm until ready to serve. Mix 2 Tbsp of dark soy sauce with 1 Tbsp of Lee Kum Kee sweet soy sauce. Mix 2 Tbsp of Lee Kum Kee chilli saue with 1 Tbsp of chicken stock and juice of 1 lime. Add a pinch of salt. Stir.